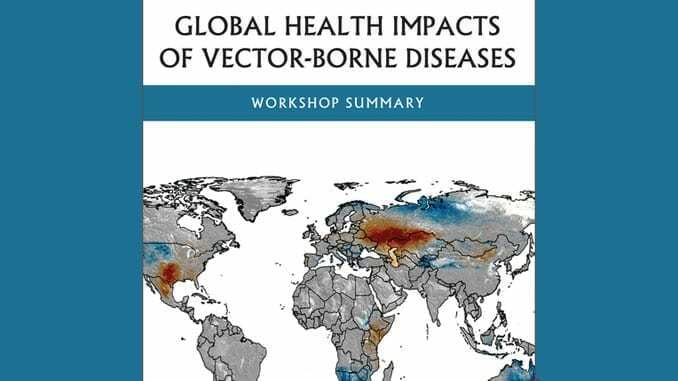 The National Academies of Science, Engineering and Medicine (NASEM) Forum on Microbial Threats has released a new summary of its most recent workshop exploring the dynamic relationships among host, pathogens, vectors, and ecosystems that characterize vector-borne diseases. The Forum revisited the trends and patterns in the incidence and prevalence of vector-borne diseases in an increasingly interconnected and ecologically disturbed world, as well as recent developments to meet these dynamic threats. Participants examined the emergence and global movement of vector-borne diseases, research priorities for understanding their biology and ecology, and global preparedness for and progress toward their prevention, control, and mitigation. Emerging Vector-Borne Diseases in the United States: What Is Next, and Are We Prepared? Pathogens transmitted among humans, animals, or plants by insects and arthropod vectors have been responsible for significant morbidity and mortality throughout recorded history. Such vector-borne diseases – including malaria, dengue, yellow fever, and plague – together accounted for more human disease and death in the 17th through early 20th centuries than all other causes combined. Over the past three decades, previously controlled vector-borne diseases have resurged or reemerged in new geographic locations, and several newly identified pathogens and vectors have triggered disease outbreaks in plants and animals, including humans. Domestic and international capabilities to detect, identify, and effectively respond to vector-borne diseases are limited. Few vaccines have been developed against vector-borne pathogens. At the same time, drug resistance has developed in vector-borne pathogens while their vectors are increasingly resistant to insecticide controls. Furthermore, the ranks of scientists trained to conduct research in key fields including medical entomology, vector ecology, and tropical medicine have dwindled, threatening prospects for addressing vector-borne diseases now and in the future.